Helpful Tips | Northern Wilderness Outfitters Ltd.
You are allowed to bring from the U.S. into Canada no more than 5 cases of beer or 2 40-oz. bottles of liquor. The first case of beer or bottle of liquor is duty free. After your first case, you will be charged about $9/case duty. Each person is allowed this. Beer and liquor is expensive in Canada. Beer is around $40/case and a 40-oz. bottle of liquor is over $40.00. For the fishermen who do not like to wash dishes we suggest that you bring paper plates, cups, bowls, as well as plastic spoons, forks and knives with your party. Instead of bringing bottled water, we suggest you bring a water purification system. They are inexpensive, reusable and can help cut down your baggage weight. We have many customers that use the Katadyn Base Camp System which is available at www.katadyn.com and www.cabelas.com. You can make your own hotel/motel reservations. The best ones in Fort Frances, Ontario, are: the Bayview Motel #807-274-5347; the Rendezvous Hotel #1-800-544-9435 or #807-274-9811; the Copper River Inn #807-274-7721; and the Super 8 #807-274-4945. If you would rather stay on the U.S. side they have: an Americ Inn (formerly the Holiday Inn) #218-283-4451, Days Inn #218-283-9441; America's Best Value Inn & Suites (formerly the Super 8) #218-283-8811; or the Falls Motel #218-283-8434. When you make your reservations, please let us know which motel you are staying at. For the fisherman who flies into International Falls, MN via Northwest Airlines or private aircraft and needs transportation to a motel or our airbase, North Air Limo Service will pick up your party for a fee of approximately $12 per person. If needed, we can make these arrangements for your party. TACKLE SUGGESTIONS: WALLEYE – spinners with minnows, leeches or worms, June Bugs, Mister Twisters, Beetle Spins, and jigs. Colors should be purple, gold, yellow, red, silver or white. 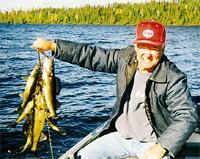 NORTHERN PIKE, LAKE TROUT, SMALLMOUTH – any type of shiny spoon or plugs 2-6 inches in length. Daredevles, Red Eye Wigglers, Dr. Spoons, Mepps, Rapalas and Lazy Ikes. On your departure from the lake the pilot will check the cabin, the grounds, and the boats to see if they have been cleaned for the next party. If they have not been cleaned, the airplane will not leave until this has been done. We need everyone's cooperation on this and it shows good sportsmanship to your fellow fishermen! For those of you who would feel more comfortable with telephone communication to the outside world from your remote wilderness cabin, satellite telephones are now available to everyone at a reasonable cost. We have 9 phones available to rent on a first request basis at a cost of $100/trip. You can also rent a satellite phone and even a fax phone from "Outfitter Satellite Phones." Their number is 877-436-2255, or you can go to their website at www.outfittersatellite.com. Your regular cellular phone will work most of the time at the Tessup Lake Outpost cabins. Confirmed fly-in and fly-out times are approximate times only. Call us about one week before your trip for a more accurate fly-in and -out time. Answer: The fishing is always great. However, sometimes the catching is slow! Question: What are they biting on? Answer: An assortment of live bait and your favorite artificial lures! Question: How much bait should we take? Answer: Some guys take in a 100 dozen (assortment of minnows, leeches and crawlers), and some guys go strictly artificial. We suggest everyone take in at least a dozen/day/person of some type of live bait. Question: What is the weather going to be like? PACKING FOR YOUR TRIP: In order to comply with safety regulations determined by Transport Canada, Northern Wilderness Outfitters must carefully plan for weight limits on all flights. Setting weight restrictions also helps us to reduce operating costs, which in turn makes it possible for us to keep our rates reasonable. Freeze your water! Ice adds to your weight and if you are bringing water you can have both for less weight! What are dangerous goods? Dangerous goods are articles or substances which are capable of posing a significant risk to health, safety or to property when transported by air. Before you pack your bags, check what you are carrying. Normal personal care items, toiletries and medicinal articles are allowed in limited quantities. There are restrictions, if in doubt, ASK! >Spare lithium or lithium ion batteries with more than 100 Wh but not exceeding 160 Wh - no more than 2 spare batteries, individually protected to prevent short circuits, must be in carry-on baggage. Batteries with more than 160 Wh must be reported to operator for special packaging. Ammunition - must be securely packaged as cargo in quantities not exceeding 11 lbs per person for that person's own use. Allowance for more than one person must not be combined into one or more packages.